If you leave your pitching machine out in the rain, it will definitely get damaged. If you plan on leaving yours outside on a permanent or semi-permanent basis, it is imperative that you get a pitching machine cover for it. 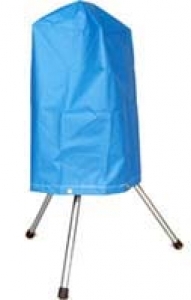 This water resistant blue vinyl BATA Medium Cover is made specifically to fit BATA pitching machines but will also cover Heater Sports and Rawlings/Spinball Sports pitching machines. It features tie down grommets at the bottom so that your pitching machine cover stays in place - even on windy days. Your pitching machine is a significant investment. Be smart and protect that investment with a pitching machine cover designed to fit your pitching machine. No matter where you order a BATA Pitching Machine Cover from, NOBODY actually stocks them; they all ship directly from the manufacturer's warehouse located in Redmond, Washington. Therefore, the shipping time frame is exactly the same no matter what website you order from (we hope that it is this one!). BATA Pitching Machine Covers typically take 5-7 business days to ship from the time you place your order. They ship via FedEx Ground and could take anywhere from a day or two to a week to get to you AFTER being shipped, depending on your proximity to their warehouse. We will notify you of your tracking number the moment we receive it from the manufacturer's warehouse.